Not to be confused with Haile Selassie or Theodor Gebre Selassie. This article is about a person whose name ends in a patronymic rather than a family name. The article properly refers to the person by his given name, Haile, and not as Gebrselassie. Haile Gebrselassie (Amharic: ኃይሌ ገብረ ሥላሴ, haylē gebre silassē; born 18 April 1973) is a retired Ethiopian long-distance track and road running athlete. He won two Olympic gold medals over 10,000 metres and four World Championship titles in the event. He won the Berlin Marathon four times consecutively and also had three straight wins at the Dubai Marathon. Further to this, he won four world titles indoors and was the 2001 World Half Marathon Champion. Haile had major competition wins at distances between 1500 metres and the marathon, moving from outdoor, indoor and cross country running to road running in the latter part of his career. He broke 61 Ethiopian national records ranging from 800 metres to the marathon, set 27 world records, and is widely regarded as the greatest distance runner in history. In September 2008, at the age of 35, he won the Berlin Marathon with a world record time of 2:03:59, breaking his own world record by 27 seconds. The record stood for three years. Since he was over the age of 35, that mark still stands as the Masters Age group world record in addition his 10000 m Masters record has not been challenged since 2008. Haile was born as one of ten children in Asella, Oromiya Region, Ethiopia. As a child growing up on a farm he used to run ten kilometres to school every morning, and the same back every evening. This led to a distinctive running posture, with his left arm crooked as if still holding his school books. Haile gained international recognition in Seoul, South Korea, when he won the 5000-metre and 10,000-metre races at the 1992 World Junior Championships and a silver medal in the junior race at the World Cross Country Championships. The next year, in 1993, Haile won the first of what would eventually be four consecutive world championships titles in the men's 10,000 metres at the 1993, 1995, 1997, and 1999 World Championships. His win at the 1993 was however his most infamous as he accidentally stepped on the heel of Moses Tanui's shoe at the bell, causing it to fly off his foot. After the contact, with just one shoe, an angered Tanui moved out to a 10-meter lead, only to have Haile run him down on the final straight. Also at the 1993 World Championships he ran in the 5,000-metre race to finish a close second behind Ismael Kirui of Kenya. In 1994 he won a bronze medal at the IAAF World Cross Country Championships. Later that year he set his first world record by running a 12:56.96 in the 5,000-metres, breaking Saïd Aouita's record by two seconds. In 1995, Haile ran the 10,000-metres in 26:43.53 in Hengelo, Netherlands, lowering the world record by nine seconds. That same summer, in Zürich, Switzerland, Haile ran the 5000 metres in 12:44.39, taking 10.91 seconds off the world record 12:55.30 (established by Kenya's Moses Kiptanui earlier in the year). This world record at the Weltklasse meet in Zürich was voted "Performance of the Year" for 1995 by Track & Field News magazine. At the same Weltklasse meet in Zürich in 1996, an exhausted Haile, suffering from blisters obtained on the hard track in Atlanta (where he had won the Olympic 10,000 metres gold), had no answer to the 58-second lap of Daniel Komen with five laps to go as Komen went on to win and just miss Haile's record, finishing in 12:45.09. In 1997, Haile turned the tables on Komen at the same meet. Coming off his third 10K world championship gold medal, Haile beat Komen in another Zürich classic on 13 August 1997, covering the final 200 metres in 26.8 seconds to break his 5000 metres world record with a time of 12:41.86. Komen, in turn, took Haile's record only nine days later when Komen ran a 12:39.74 performance in Belgium. The next year, 1998, saw Haile lowering the indoor world records for 2000 and 3000 metres, enjoying success outdoors by taking back both the 5000 and 10,000 metres world records, as well as earning a share in the Golden League jackpot for winning all of his races in the Golden League series that summer. In June 1998 in Hengelo, Netherlands, Haile set a 10,000 metres world record 26:22.75, breaking Paul Tergat's world record 26:27.85, running evenly paced 13:11/13:11 5K splits. Just 13 days later, Haile took on the 5000 metres mark of Komen in Helsinki, Finland. Croatian pacemaker Branko Zorko took the pace out slowly, hitting 1000 metres in 2:33.91 and dropping out at the mile. Million Wolde and Assefa Mezgebu led Haile through 2000 metres in 5:05.62. His pacemakers could not maintain the pace, though, and Haile was left alone for a difficult solo effort six laps out. Hitting 3000 metres in 7:38.93, even the British commentators announcing the race counted him out. With four laps to go (8:40.00), Haile needed a sub-4-minute final 1,600 metres for the record. With one lap to go and in great pain, Haile took off, recording a final lap of 56.77 seconds and a final 1,600 metres of 3:59.36 (= 4:00.96-mile) to race to a 12:39.36 world record. In 1999, Haile starred as himself in the movie Endurance. The film chronicled his quest to win Olympic gold in the 10,000 metres in Atlanta. On the track, he won a 1500/3000 metres double at the World Indoor Track Championships, defended his Outdoor World Track Championships 10,000 metres title, and remained undefeated in all his races (which ranged from the 1500 up to 10,000 metres). In 2000, Haile again won all of his races, ranking first in the world yet again in both the 5000 and 10,000 metres. At the 2000 Sydney Olympics, he became the third man in history to successfully defend an Olympic 10,000 metres title (after Emil Zátopek and Lasse Virén). The narrow Olympic victory over Kenya's Paul Tergat came down to a blistering final kick, with Tergat's 26.3 second final 200 metres being topped by Haile's even faster 25.4. The winning margin of victory was only 0.09 seconds, closer than the winning margin in the men's 100 metre dash final. In 2001, Haile won the IAAF World half marathon and the bronze medal in the 10,000 metres at the 2001 World Championships in Athletics. In the same year, he conceptualized the Great Ethiopian Run with Peter Middlebrook, which was latterly supported by Brendan Foster, British runner Richard Nerurkar the British ambassador to Ethiopia Myles Wickstead. On 30 August 2003, Haile topped the polls when elected as a member of the IAAF Athletes Commission. Also in 2003, at the World Championships in Paris, Haile was involved in one of the most remarkable 10,000 metres races of all time while gaining a silver medal behind countryman Kenenisa Bekele. The last half of the 10,000 metres final at the championships was completed in a staggering 12:57.24 (12:57.2 for Bekele and 12:58.8 for Haile). According to the IAAF, "Not only was this split the fastest closing 5000 metres in the championships 10,000m (the previous record was 13:12.12, recorded in Atlanta), but it was also the fastest 5000 metres in a global championships surpassing the 12:58.13 Salah Hissou recorded when he won the 5,000m in Sevilla'99." (This remark remained true until a week later when the World Athletic Championships 5000 metres medalists (including Bekele) all ran faster than the second 5000 metres split in the previous week's 10,000 metres.) "The difference between the closing 5000 metres splits (12:57.24) and the 5000 metres World record (12:39.36) was 17.98 seconds, which is a record. The previous best of 18.4 seconds (13:31.4 for the closing 5000 metres when the World Record was 13:13.0) was recorded in the 1976 Olympics." In the 2004 Athens Olympics, Haile sought to become the first man in history to win three straight Olympic gold medals in the 10,000 metres. He was unable to do so; however, he finished fifth in a race won by his compatriot Kenenisa Bekele, who had broken both of Haile's major track world records, the 5000 metres and the 10,000 metres records. Shortly before the Athens games, Haile was unable to train for three weeks due to inflammation of his Achilles tendon. The injury was severe enough that he would not have competed otherwise, but did so because of significant pressure from his country. This loss of the final period of training likely cost him a medal. Since leaving the track after the 2004 Olympics, Haile has focused on road racing and the marathon. His adult marathons to date include London 2002 (3rd place), Amsterdam 2005 (1st place), London 2006 (9th place), Berlin 2006 (1st place), Fukuoka 2006 (1st place), London 2007 (dnf), Berlin 2007 (1st place and World Record), Dubai 2008 (1st place), Berlin 2008 (1st place and another World Record), Dubai 2009 (1st place) Berlin 2009 (1st place), Dubai 2010 (1st place), and NYC 2010 (dnf). In 2002, Haile made his debut at the marathon at the London Marathon. He started the race with a very fast pace, within world record time. He was unable to hold it, however, as world record holder Khalid Khannouchi and Paul Tergat both eventually passed him. Khannouchi broke his own world record, while Haile finished third. Haile started 2006 positively by beating the world half marathon record by a full 21 seconds, recording a time of 58 minutes and 55 seconds on 15 January. He broke the record, his first one on American soil, by running the half marathon of the Rock 'n' Roll Arizona Marathon. During the race he also broke Paul Tergat's 20 km record, both records having stood since 1998. (Haile passed the 20 km mark in 55:48.) That year also marked another victory for Haile as he shattered the 25 km world road record (albeit in non-IAAF ratified fashion) by 68 seconds in a time of 1:11.37. The race was organized where Haile and six other runners would run 5 kilometres and then cross the starting line of the 20-K Alphen race in Alphen aan den Rijn of the Netherlands. On 23 April 2006, he finished ninth in the London Marathon with a time of 2:09:05 (the race was won by Kenyan Felix Limo, who clocked 2:06:39). Haile referred to the ninth-place finish as "the worst race of my career". However, on 24 September he came back with a win in the Berlin Marathon in the fastest time of the year, 2:05:56. His time in Berlin made him only the fifth man in history to run under 2:06 for the marathon. This was followed by a win in the Fukuoka Marathon in Japan in 2:06:52. In London on 22 April 2007, Haile challenged the 2006 London Marathon winner Felix Limo, 2005 London Marathon winner Martin Lel, 2004 Athens gold medalist Stefano Baldini, 2006 New York Marathon winner Marílson Gomes dos Santos, and the then marathon world record holder Paul Tergat in what organizers anticipated would be an exciting race. However Haile dropped out at the 18-mile (29 km) stage complaining of a stitch and inability to breathe, which turned out to be an allergic reaction to the pollen in the air. This left the 2005 winner Martin Lel to come home in first place. One month later, Haile made a surprise return to the track for the first of two stadium races that summer. In the first, he ran a 26:52.81 in finishing fifth in a very competitive 10,000 metres race in Hengelo, The Netherlands. Then, on 27 June 2007, Haile launched an attack upon the world record for the one hour run, in Ostrava, Czech Republic. This record attempt was successful as Haile passed the hour mark at 21,285 metres (13 miles 397 yards), eclipsing the previous best of 21,101 metres, set by Mexican Arturo Barrios in La Flèche, France, on 30 March 1991. Furthermore, Haile covered 50 laps (20,000 m) in 56:25.98, another world best, well within the previous 56:55.6 also set by Barrios in 1991. These were his 23rd and 24th world records. On 30 September 2007, Haile won the Berlin Marathon in 2:04:26 (4:44.8 per mile), setting the world record and shaving 29 seconds off Paul Tergat's record, set on the same course in 2003. His victory further energized the celebrations of the Ethiopian Millennium (unique to the Ethiopian calendar), which began on 12 September 2007. Prior to the 2008 Dubai Marathon, his manager suggested that Haile would be able to run a sub 2:04 time for a new world record. While Haile agreed that a sub 2:04 was possible, he stated that the conditions would need to be perfect for such a time. The event was held on 18 January 2008, and was won by Haile in a time of 2:04:53, making it the second fastest marathon in history. However the early pace had been too fast and he was unable to continue at that speed, resulting in a time 27 seconds short of his own world record. At the Hengelo FBK-Games on 24 May, Haile ran 26:51.20 for the 10,000 metres to finish a close second behind countryman Sileshi Sihine's 26:50.53. This is the Master 35-39 age group world record. Along with his 10,000 meter performances in 2003, 2004, and 2007, Haile is the only man older than 30 years of age to break 27 minutes in the 10,000 metres; his nine career sub 27-minute 10,000 meter performances is more than any other athlete except for Kenenisa Bekele, who also has nine. Because of Beijing's air pollution levels, Haile decided to withdraw from the marathon at the 2008 Beijing Olympics. He suffers from asthma and said that running in such conditions might be harmful for his health. Haile later admitted that he regretted the decision as the Beijing air was cleaner than expected. He did, however, run the 10,000 metres on 17 August, finishing sixth with a time of 27:06.68. The gold medal went to his countryman and current world record holder, Kenenisa Bekele with a 27:01:17 Olympic record winning time. The following month, on 28 September 2008, he defended his Berlin Marathon title, averaging 2:56.5 per kilometer (4:43.7 per mile) for a time of 2:03:59, breaking his own world record by 27 seconds. Haile won the Dubai Marathon on 16 January 2009, but fell short of breaking his own world record that he had set four months earlier on the flat course. He finished in 2:05:29, well ahead of countryman Deressa Chimsa. In September that year, he won the Berlin Marathon for the fourth consecutive time. He attempted to break the world record he had set the previous year but, despite a quick start, warm conditions saw him finish in 2:06:08, two minutes away from his best mark. He did, however, pass the 30-kilometer point in 1:27:49, which is a new world record for a road 30K. In 2010 he tried to attack his own world record for the third consecutive time at the Dubai Marathon 2010. Although he won the race with a time of 2:06:09, he failed to break his 18-month world record. In a post-race interview he revealed that he had suffered back pain, requiring intensive pre-race physiotherapy, resulting from having slept in a bad position. His problems continued at the NYC Half Marathon, where he pulled up mid-race visibly uncomfortable in his running. He had an easy victory in the inaugural edition of the 10K de Madrid in April. He scored his third victory at the Great Manchester Run the following month, although he missed out on Micah Kogo's course record. He followed this with his first win at the Great North Run in September, finishing the half marathon in a time of 59:33 minutes. He is also mentor and ambassador for the G4S 4teen, a programme supporting 14 young athletes. On 7 November, after dropping out of the 2010 New York City Marathon with an inflamed knee, Haile announced his retirement. Days later, he posted to his Twitter account that he was reconsidering his decision and wanted to run in the 2012 London Olympics. Haile had stated previously that after retiring he would like to enter politics, with scepticism from the public about his knowledge on politics and the unfamiliar culture of celebrities holding public office in Ethiopia. However he won his first race back in a 10k road race in Angola with a new course record of 28:05 and beat countryman Deriba Merga and the Kenyan Josphat Menjo who had run the fastest 10000m of that year. Haile missed the 2011 Tokyo Marathon due to an injury, but won the half marathon at the Vienna City Marathon on 17 April 2011. About a month later Haile easily won the Great Manchester Run in England for the fourth time, finishing in 28:10. On 26 September he suffered a double setback when he dropped out of the Berlin Marathon (again suffering from respiratory difficulties of exercise-induced asthma) and saw his world records for 30 kilometres and the marathon broken by the man with whom he had been duelling, Patrick Makau. Haile was absent from the press conference later that day, but his manager Jos Hermens announced that while it was "the end of an era of record breaking for Haile, it's not the end of his career". He returned to his winning ways at the Birmingham half marathon with a new course record and followed that up with a win at the Zevenheuvelenloop in November, taking his third career victory at the Dutch 15K race. In 2012, Haile ran in the Tokyo Marathon and, after surging to the lead and putting a gap on the field with 6 km to go, faded and finished in 4th, in a time of 2:08:17. However, he bounced back to win the Vienna Half Marathon in 1:00:52, catching Paula Radcliffe who was given a 7:52-minute head-start. He was not selected for the Olympic marathon team, but after winning the Great Manchester Run with a fast time of 27:39, beating marathon world record holder Patrick Makau, world marathon leader Ayele Abshero and Olympic marathon medallist Tsegay Kebede, by a distance of over 100 metres, he decided to aim for a place in the 10,000 m race. He attempted to earn an Olympic spot at the Fanny Blankers-Koen Games in Hengelo, the stadium in which he had broken four world records. However, in extremely hot weather he finished seventh with a time of 27:20.39, sixth amongst Ethiopians, and did not qualify for the 2012 Summer Olympics. However, he did appear at the opening ceremony as one of the eight flagbearers who brought the Olympic flag into the stadium. Another outing at the Fukuoka Marathon, however, saw him enter as favourite but drop out at 32 km. On April 14, 2013, Haile won the open field of the Vienna City half marathon with a time of 01:01.14. He set his first over-40 world record with a time of 46:59 for 10 miles in Switzerland, on 15 September 2013. He took 3rd overall in the 2013 BUPA Great North Run, 32 seconds behind the winner Kenenisa Bekele and 31 seconds behind the reigning Olympic and world champion Mo Farah. Haile has announced his retirement from competitive running after finishing 16th in the Great Manchester Run on Sunday May 10, 2015. It brings to an end a 25-year career in which he claimed two Olympic gold medals, eight World Championship victories and set 27 world records. "I'm retiring from competitive running, not from running. You cannot stop running, this is my life," he told BBC Sport. Haile remains the world record holder at 20,000m, the one-hour race and 10 mile run. Currently, Haile is president of the Ethiopian Athletics Federation, and has become a small-lot coffee farmer in Ethiopia. His coffees can be found under his estate name, Haile Estate, such as the Sun Dried Ethiopian Haile Estate Coffee, which is distributed by Starbucks Reserve. ^ "Gebrselassie's great plan". The Independent. UK. 2 June 2000. Archived from the original on 7 January 2008. Retrieved 4 May 2010. ^ "Men's 10,000m: Gebrselassie may be the best of all time". CBC Sports. 6 August 2001. ^ "Haile successful: Gebrselassie reminds us once again of his greatness". Sports Illustrated. 5 August 2007. Retrieved 4 May 2010. ^ Longman, Jere (13 April 2002). "MARATHON; Gebrselassie's Plan Could Hurt Him in the End". The New York Times. ^ "Steinle seeking London glory". London: BBC Sport. 4 April 2002. ^ "Profiles: Haile Gebrselassie". International Olympic Committee. Archived from the original on 28 December 2010. ^ IAAF 1999 World Indoor Championships Men's 3000 metres biographies Archived 20 August 2012 at the Wayback Machine. IAAF. Retrieved on 2014-01-12. ^ Ethiopian Runner Adds 5,000 Meters to List of Records. Los Angeles Times (1998-06-14). Retrieved on 2014-01-12. ^ "Paris 2003 – from a distance". IAAF.org. 2 September 2003. ^ "Brilliant Bekele takes gold". London: BBC Sport. 20 August 2004. ^ "Haile farewell". IAAF. 23 August 2004. ^ "Khannouchi breaks world record". London: BBC Sport. 14 April 2002. ^ "Gebrselassie targets Fukuoka Marathon in December". IAAF. 11 October 2006. ^ "World's Greatest Marathon Runners set for London: Gebrselassie, Tergat, Baldini, Gharib And Limo". Archived from the original on 20 April 2007. ^ Robbins, Liz (30 August 2007). "Marathon Record Is Set in Berlin". New York Times. Retrieved 4 May 2010. ^ "Sub 2:04 perfection possible for Haile in Dubai?". IAAF. 7 January 2008. ^ "Second fastest of all time for Gebre in Dubai Marathon". IAAF. 18 January 2008. ^ "Gebrselassie opts out of marathon". London: BBC Sport. 10 March 2008. ^ "Blue sky in Beijing makes Haile regret pulling out of marathon". Indian Express. 19 August 2008. Archived from the original on 19 August 2008. Retrieved 4 October 2008. ^ Gebrselassie retains Berlin crown. BBC Sport (20 September 2009). Retrieved on 2009-09-20. ^ Kamais and Yamauchi Triumph at NYC Half-Marathon. IAAF/New York Road Runners (21 March 2010). Retrieved on 2010-03-23. ^ Valiente, Emeterio (25 April 2010). Course record for Cherogony, while Gebrselassie 'jogs' to 10Km victory – Madrid Marathon report. IAAF. Retrieved on 2010-04-29. ^ Martin, David (16 May 2010). Gebrselassie and Kidane score Ethiopian sweep in Manchester 10Km. IAAF. Retrieved on 8 June 2010. ^ Butcher, Michael (19 September 2010). Gebrselassie and Adere take Great North Run titles Archived 21 September 2010 at the Wayback Machine. IAAF. Retrieved on 2010-09-19. ^ "Gebrselassie announces retirement". BBC News. 7 November 2010. ^ "Haile Gebrselassie Announces Retirement after NYC". New York: Flotrack. 7 November 2010. Archived from the original on 9 November 2010. ^ "NYC Marathon: Guts From Chile, Glory For Ethiopia: NPR". Archived from the original on 15 November 2010. Retrieved 2 April 2018. ^ France-Presse, Agence (11 November 2010). "Reconsidering Retirement". The New York Times. ^ n°97 - Haile Gebrselassie - 100 Olympic Athletes To Watch. Time. ^ "Gebrselassie, Kiprotich take Vienna City race titles". CNN. 17 April 2011. ^ Wenig, Jorg (15 May 2011). Gebrselassie takes fourth Manchester 10Km victory, Clitheroe surprises. IAAF. Retrieved on 2011-05-27. ^ Butcher, Pat (25 September 2011). Makau stuns with 2:03:38 Marathon World record in Berlin! – UPDATED. IAAF. Retrieved on 2011-11-21. ^ van Hemert, Wim (20 November 2011). 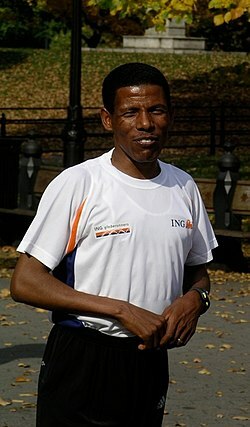 Gebrselassie heads Ethiopian double in Nijmegen. IAAF. Retrieved on 2011-11-21. ^ Wenig, Joerg (20 May 2012). 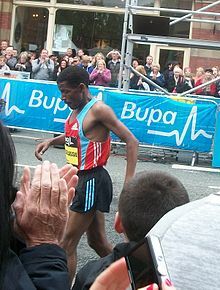 Gebrselassie takes another strong 10k victory in Manchester. IAAF. Retrieved on 2012-05-22. ^ Van Hemert, Wim (27 May 2012). Kszczot and Chepseba impress as Gebrselassie's London ambitions end in Hengelo – IAAF World Challenge. IAAF. Retrieved on 2012-05-27. ^ Nakamura, Ken (2012-12-02). 2:06:58 win for Gitau in Fukuoka. IAAF. Retrieved on 2013-02-14. 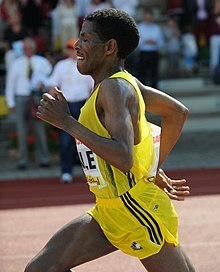 Wikimedia Commons has media related to Haile Gebrselassie.